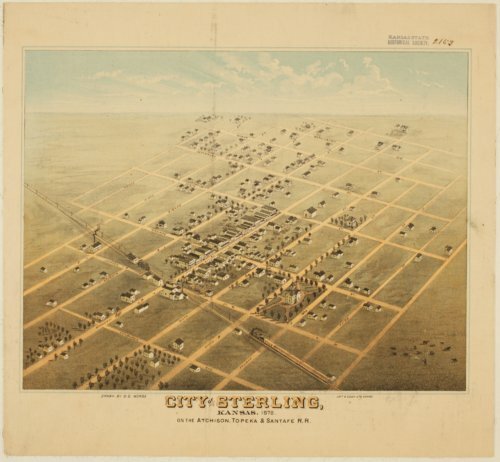 This colored lithograph is a bird's eye view of Sterling, Rice County, Kansas. The streets are named but the buildings are not identified. The business district is obvious as are the residences. The Atchison, Topeka, and Santa Fe Railroad ran through Sterling. There is a large public building on its own block that is probably a public school, based on information from other maps. The lithograph was drawn by D. D. Morse and published by Lott & Zeuch Lithograph, Chicago, Illinois.